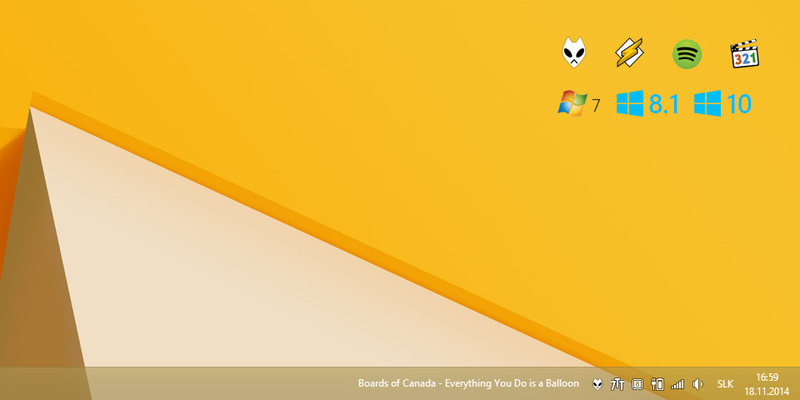 A minimal Windows Explorer "shell extension" that displays the title of the currently playing song in your Windows taskbar. The title is displayed in exactly the same style as the Windows clock as long as a song is playing. 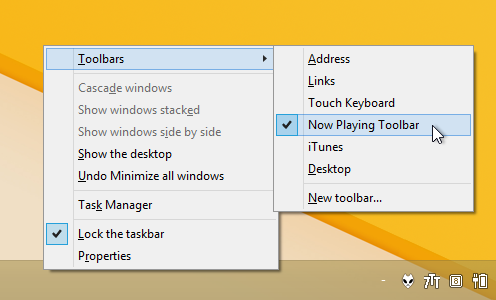 The toolbar is CPU/memory/energy efficient and works great with HighDPI modes (4K displays and such). Supported players: WinAmp, Foobar2000 (needs a tiny plugin - included), Spotify and MPC-HC. Supported OSs: 64bit versions of Windows 7, Windows 8.1, Windows 10 and maybe Vista. Until I get to making an installer, you need to install this manually, by copying the files to a desired location (e.g. C:\Program Files\), running "register toolbar.cmd", restarting Explorer (or logging off and on) and finally right clicking on the taskbar and enabling the toolbar (see the 2nd image).